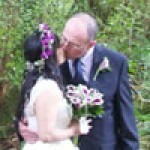 I wanted to send you an email to tell you how much we loved our flowers! They were absolutely gorgeous!!! Did you end up seeing any pictures? If not, I will send some over. Honestly we appreciate all your hard work in making our centerpieces perfect. My bouquet was also amazing!!!! Loved everything. I will definitely recommend everyone to you. Thank you for making our day so special!! I can't thank you enough for the lovely florals for the wedding. They were beautiful!! And I love love LOVED the coronet. It just was the icing on the cake I was looking for. Thank you, Amy and the rest of your team for making our special day even more special. 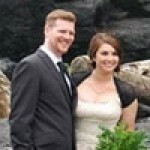 I wanted to thank you for doing such a beautiful job on our flowers for our Aug 22nd wedding at Long Beach Lodge. They were beautiful!!!!! I loved my bridal bouquet. 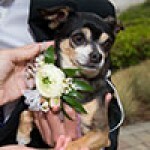 I also loved the wrist corsages and the matching flower collar you made for Carmela, the wedding party Chihuahua. Many big thank yous again!! Thank you so much! The bouquets were PERFECT!! It was such a beautiful day.